Heat Arms (ヒートアームズ) is a boss fought at the end of Lava Reef Zone Act 1. It will first attack with two swaying antenna-like machines that fire a round of projectiles at you. 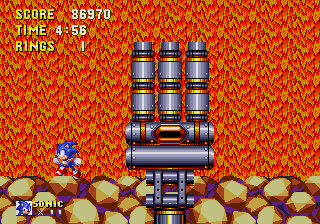 The top circle part of each must be hit 4 times to destroy them; this is a harder task for Knuckles, who can only hit them when they come down. After shooting at you, they will sink down and a robotic hand that resembles the final boss' at the Death Egg Zone will attempt to crush you, leaving a moment for you to attack when it slams down. The boss -- the hand specifically -- takes six hits -- defeating the antennae is not necessary. Unlike most times when the character is crushed, this will not kill them, but act like a normal attack; Super and Hyper Forms can damage the robot when it is crushed down on them. After it attacks once, the antennas will come back if not defeated and continue that cycle; otherwise, that hand will come out again. Overall, this boss should give you little trouble and only serve up as a warm up for the much harder boss later in the zone. It is possible to be crushed by it in Super/Hyper form but only if the player uses spin dash while under it for some reason. Tails, due to his smaller size, will be crushed even when not spindashing.